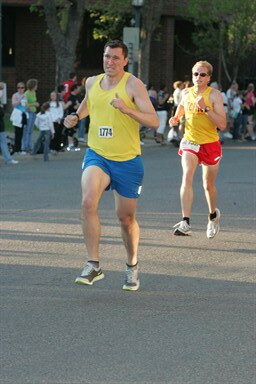 Last Thursday night I ran that TC 1 Mile race downtown. Â It was fun getting to run downÂ Nicollet Mall. Â The race itself got out to a quick start. Â I was hoping to run under 5 minutes and I knew it would be close. Â I started out about 3 rows back at the starting line which I hoped wouldn’t put me behind too many slower folks. Â It wasn’t too much of a problem though as most of the people went out quickly. Â They had clocks at every quarter mile which was nice because trying to check my watch was tough during the race. Â It just went by too quickly. I only rememeber the times from the first two quarters. Â I went through the first quarter in 73 seconds which I was happy about. Â I was just hoping to keep the pace up. Â I got boxed in a couple of times though and had to make some serious adjustments to get out and around some people. Â I went through the half at 2:31 so I knew I had to push the 3rd quarter. Â Yeah, that didn’t happen. Â I don’t remember the exact time but I knew my goal of 5 minutes was pretty much lost when I was going into the “bell lap.” Â The race had a great downhill finish and I did my best to stick close to the tangent the last couple of blocks which was the only part of the race that wasn’t completely straight. Â I finished in 5:09 which was the same time I ran at the USATF indoor mile a couple of months ago. Â I know I’m in better shape now and I didn’t feel nearly as tired at the finish which means I just didn’t pace as best I could. Â Of course that’s why I was out there in the first place: to get experience running that short of a race. Â Next time I just need to push that 3rd quarter harder. Here’s results for the race. Look at that face. That’s how you know he’s a serious runner.